Hi ya, all! 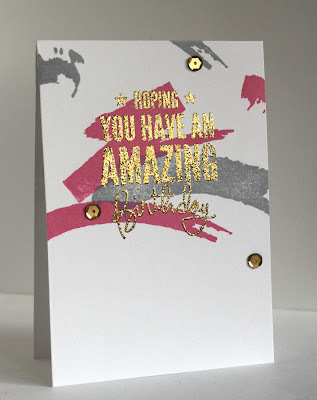 I am extremely excited to be one of the Stamping Royalty Honorable Mentions. While I know that I am far from being crowned, this is a huge boost of confidence in me. 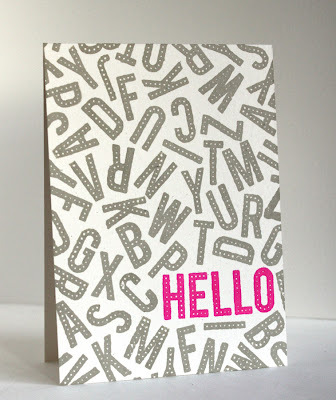 Thanks so much to all at Paper Crafts magazine that have chosen my card! 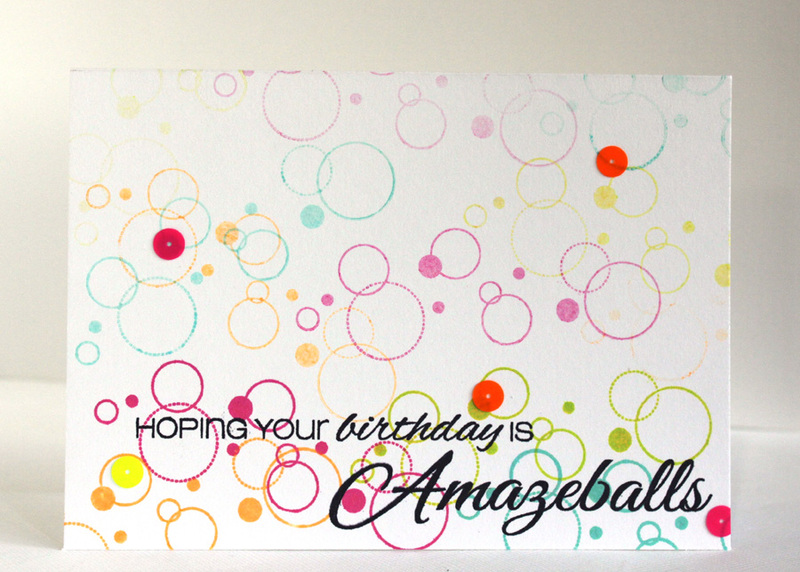 =) Here is my card in the Birthday category. 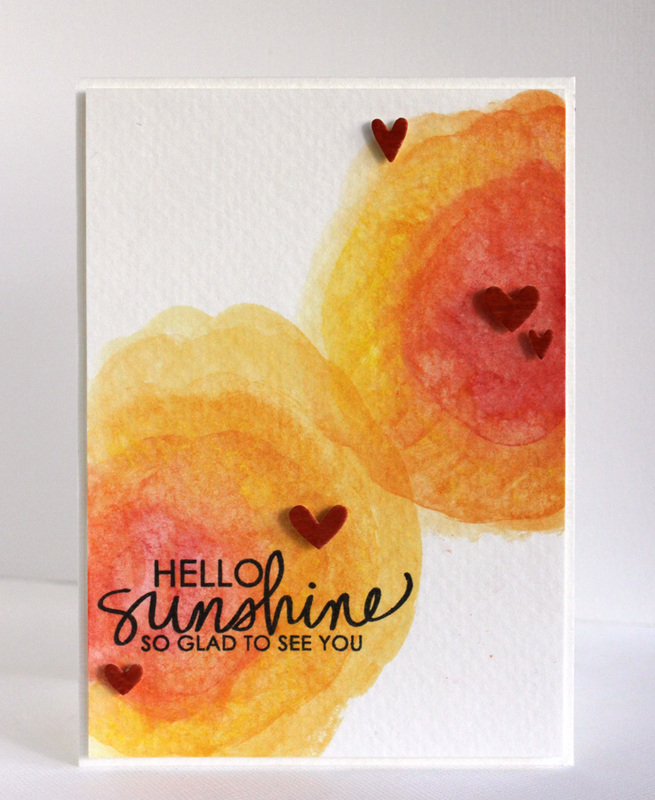 The brush strokes are from Papertrey Ink's Watercolor Wonder set and the sentiment is from Happy Every Day set by Simon Says Stamp. That's all for now. Hope you have a happy day! Happy Monday, my friends! Here is a card that I made for The Wonder of Watercolor Challenge in the Moxie Fab World. Because of the colors I used, I thought the sentiment from Technique Tuesday's Bring on the Sun set was a perfect fit. The hearts are cut out from thin birch wood then colored with a red Copic marker. 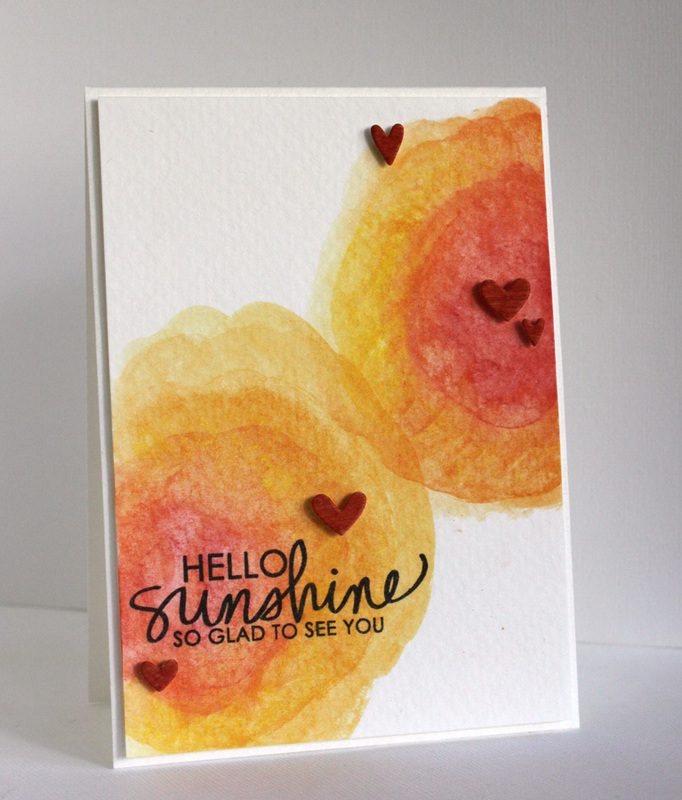 Have a sunshiny day and thanks for stopping by! 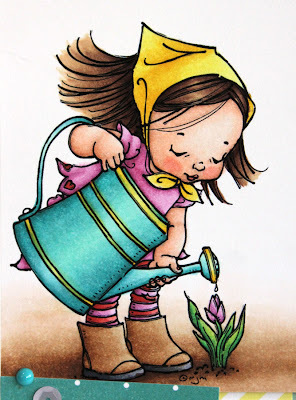 Happy Sunday, my friends! 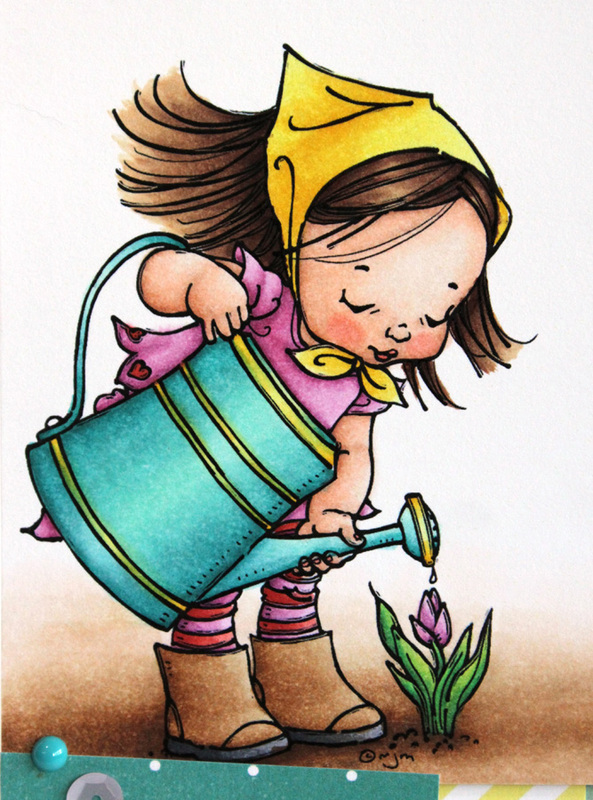 Hope you are having a lovely weekend. Here is a card that I made for this month's challenge over at Inspiration Journal. 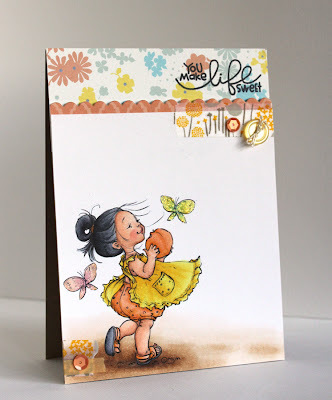 April's challenge is Marvelous Masks and Spectacular Stencils and there is still time to submit your projects for a chance to win! Inspired by this post by my super talented friend Virginia, I decided to make my own mask. 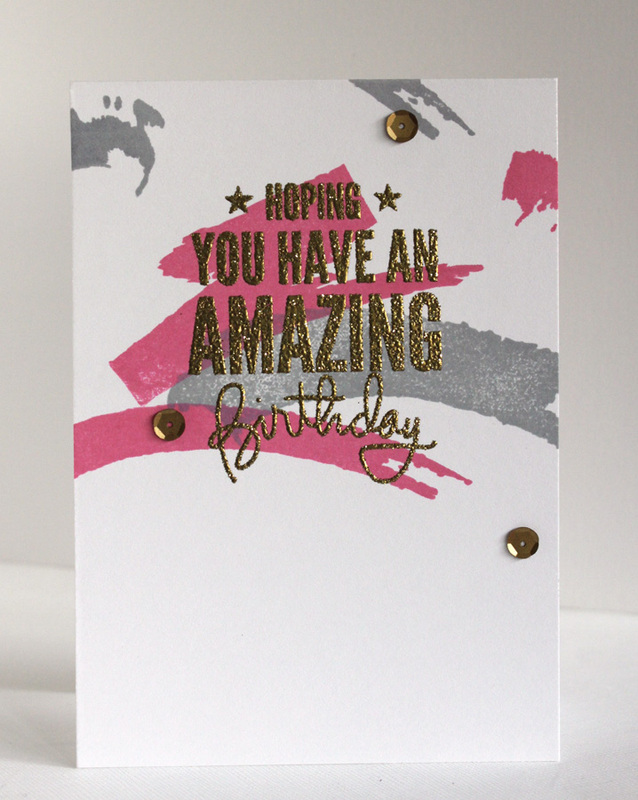 I used three dies from Paper Smooches' Hexalongs die set and created a simple mask with a piece of acetate. 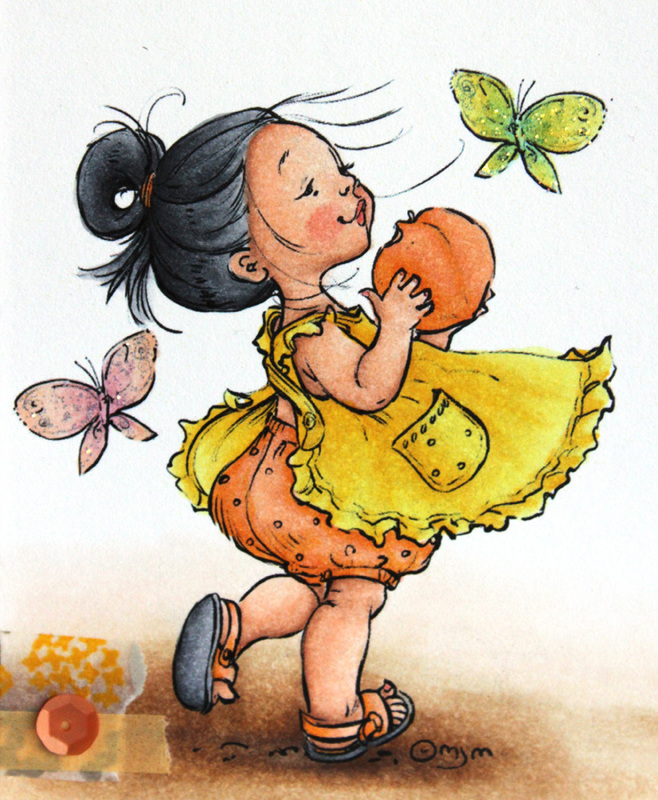 After taping the mask down, I sponged Ripe Persimmon and a little bit of Wild Honey distress inks to create the background. 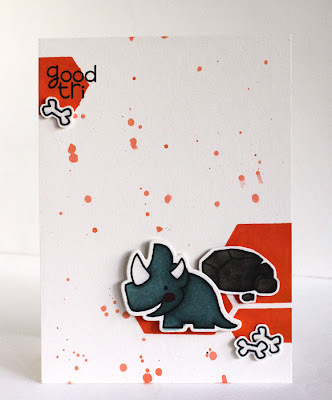 Some Ripe Persimmon ink splatter was also added later on for a little interest. 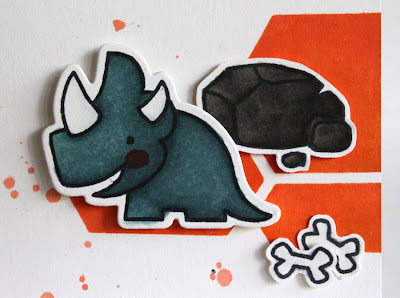 The adorable dinosaur, rock and bones are from Cutasaurus set and colored with Copic markers. The sentiment is also from the Cutasaurus set. 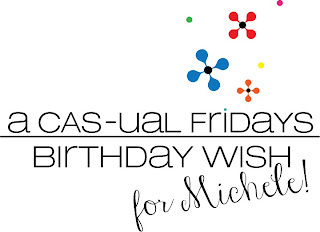 Happy Weekend, all! 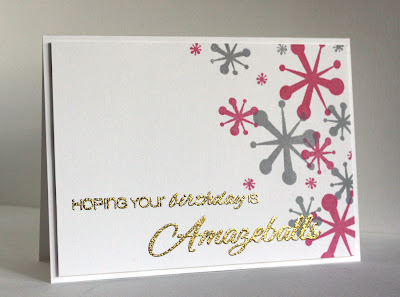 =) Here is a card that I made using a lovely image from Mo's Digital Pencil. This image is called Did You Hear? and it's printed on Papertrey Ink's Rustic White cardstock, colored with Copic markers then trimmed to size. The patterned paper is from Farm Girl 8x8 Paper Pad by October Afternoon and the sentiment is from Talk Bubbles 2 set by Simon Says Stamp. Hi ya, all! 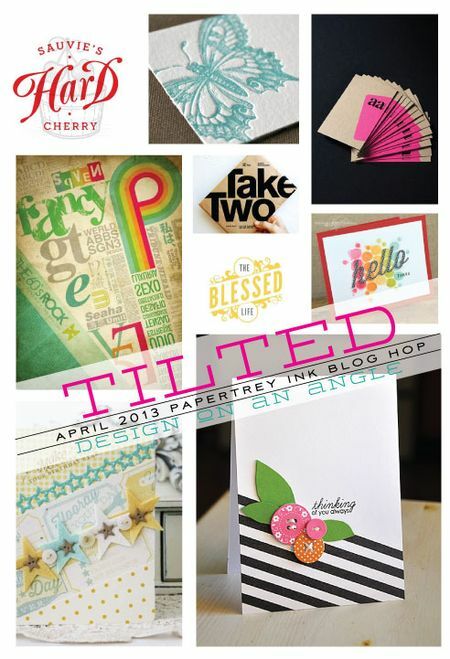 I am joining in on the Papertrey Ink April Blog Hop today! 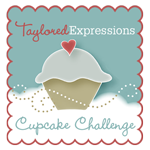 Here is the challenge for the blog hop. 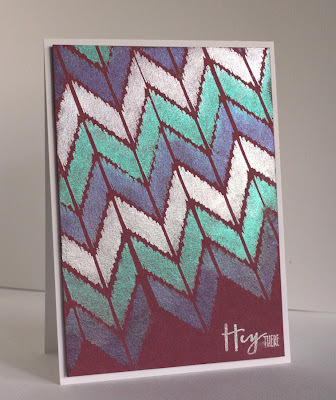 The challenge is to design on an angle and I decided to combine the challenge with this week's Make It Monday #113 which is to use Perfect Pearls on your project(s). 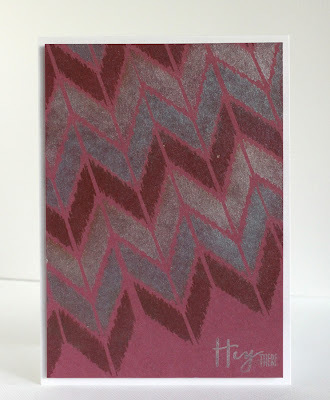 I first stamped the v from Irresistibly Ikat set with VersaMark then brushed on Perfect Pearls in Perfect Pearl, Turquoise and Plum. 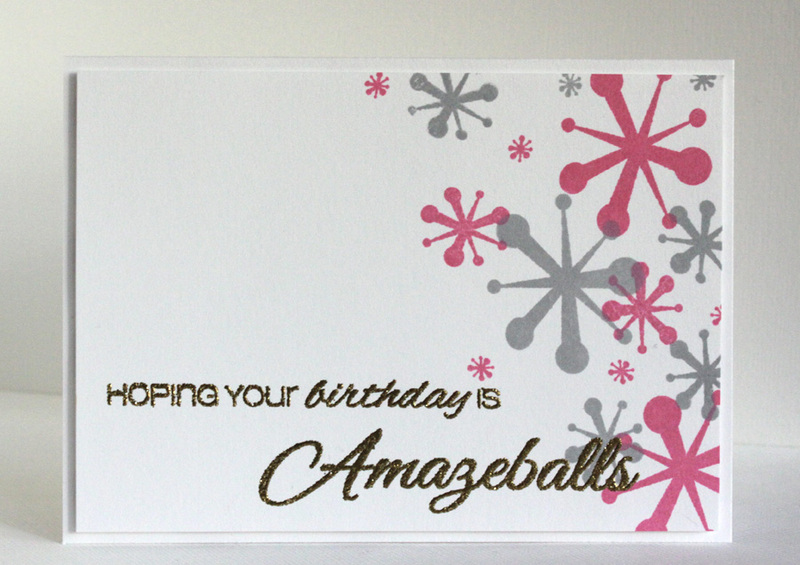 The sentiment from the same stamp set is brushed with Perfect Pearl. After brushing the excess powders off, I spritzed the piece with some water then dried it with a heat gun. 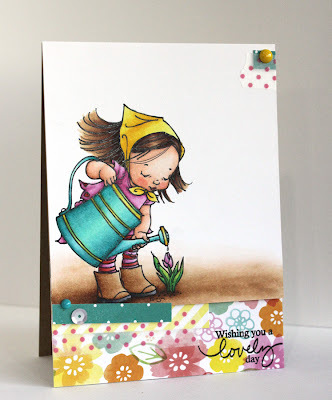 I vaguely remember Mr. Tim Holtz has mentioned that water help sets the powder and it seemed to work. 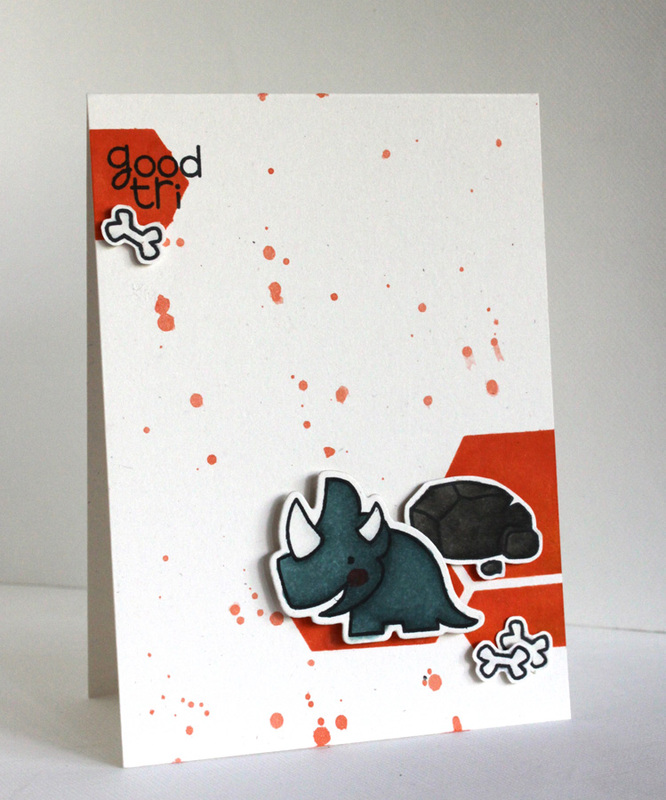 The piece is then mounted on a white card base. 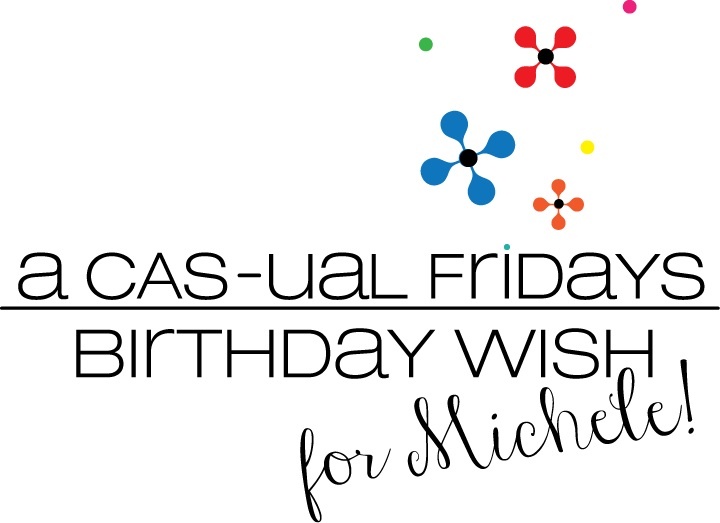 Surprise Birthday Blog Hop for Michele! 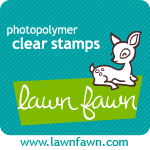 Thanks for hopping with us. 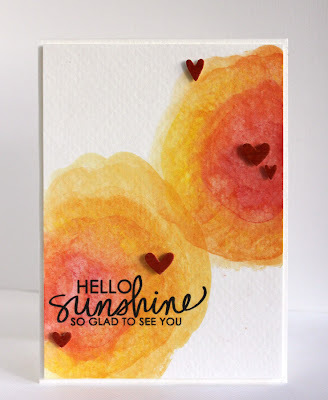 You probably arrived from Sanketi's Blog. 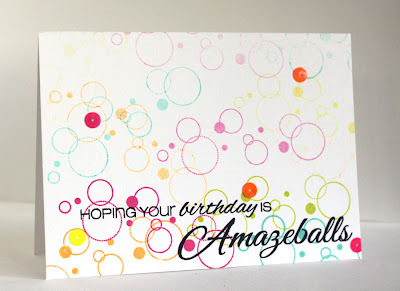 If not, you can celebrate with us and start the blog hop from Leigh Ann's Blog. Have a amazing day and thanks for stopping by! Happy Sunday, all! 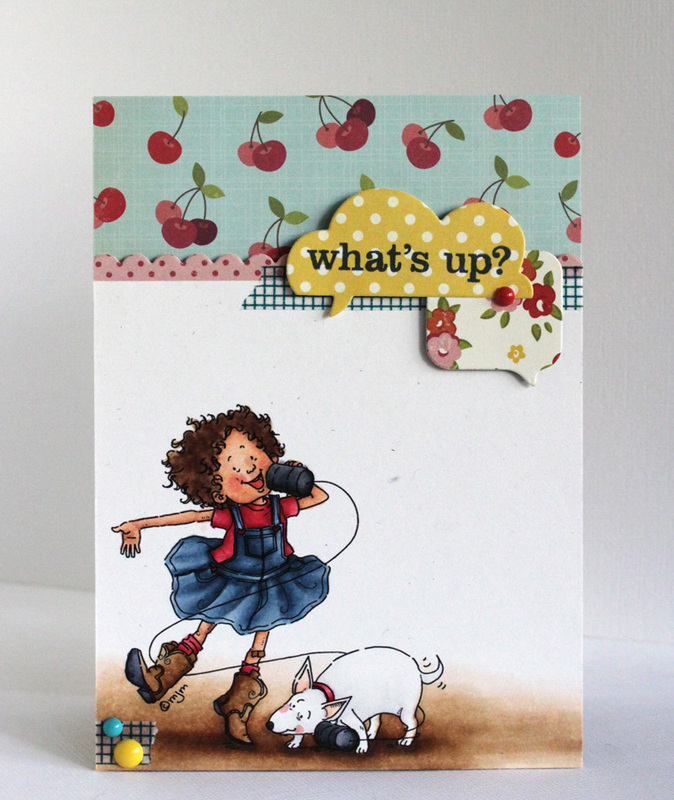 =) Here is a card that I made using a sweet image from Mo's Digital Pencil. Isn't she the cutest? =) I adore this little girl! This image is called Peaches and she is printed on Papertrey Ink's Stamper's Select White cardstock, colored with Copic markers then trimmed to size. 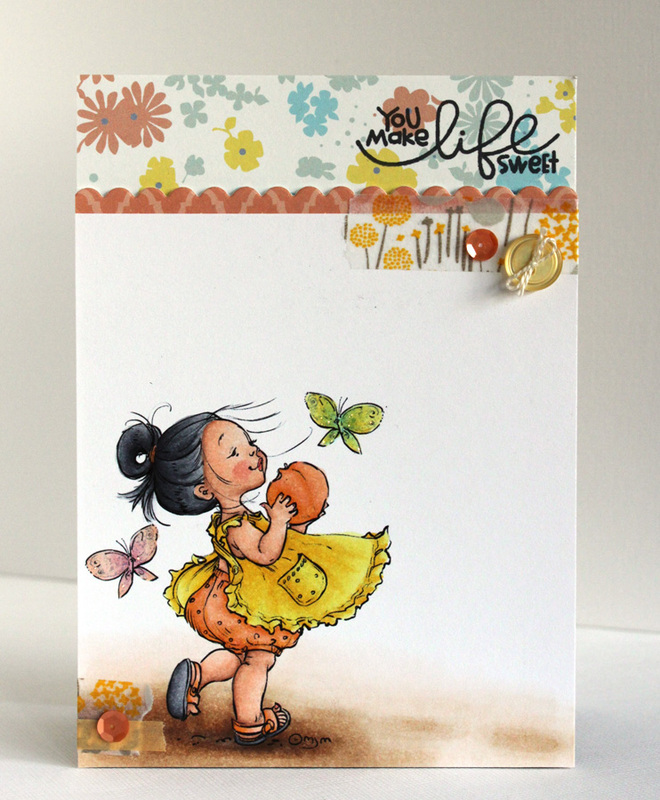 I added Diamond Stickles to the wings of the butterflies for a little sparkle. 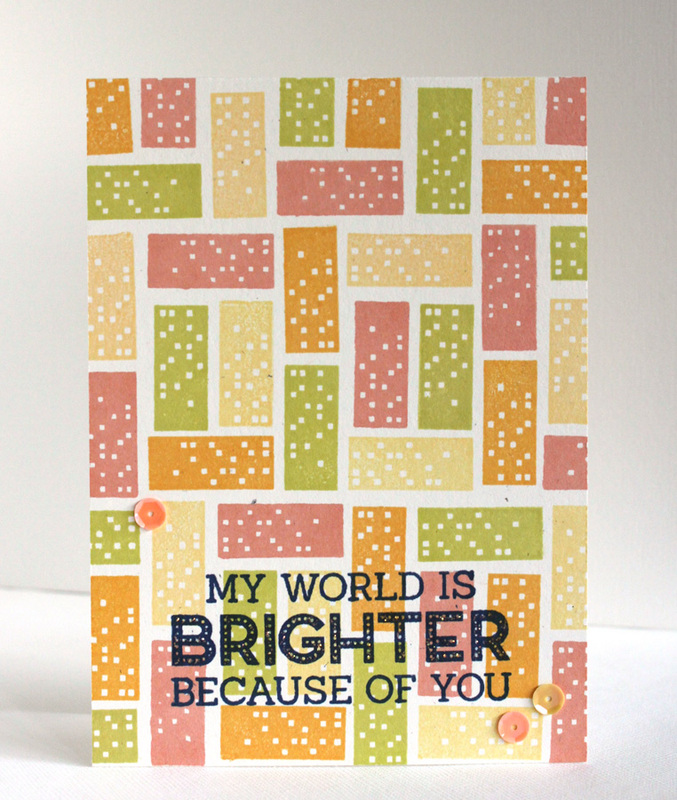 The patterned paper is from Daphne's Closet 6x6 Paper Pack by Lawn Fawn and the sentiment is from Sugar Rush set by Paper Smooches. Happy Weekend, my friends! 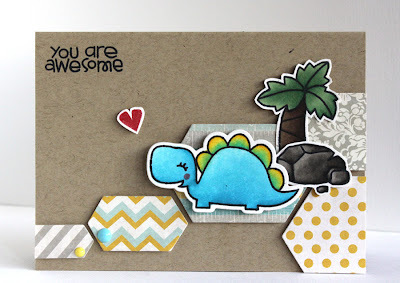 =) Here is a card that I made using some fun goodies that you can find in Inspiration Emporium. The dinosaurs from Cuteasaurus set is die cut then stamped on PTI's Rustic White cardstock then colored with Copic markers. 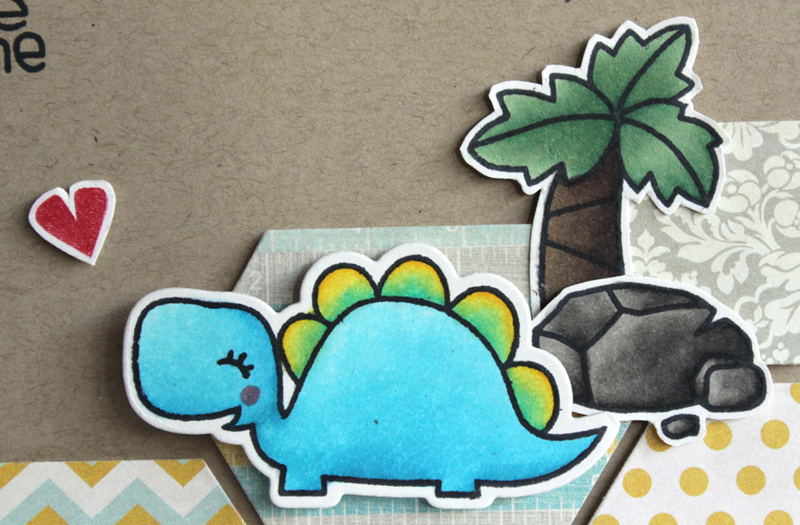 The tree and rocks are stamped on the same paper then fuzzy cut out. The patterned paper is from Park Bench 6x6 paper pad by Fancy Pants and they are cut using the fun Hexalongs die set. 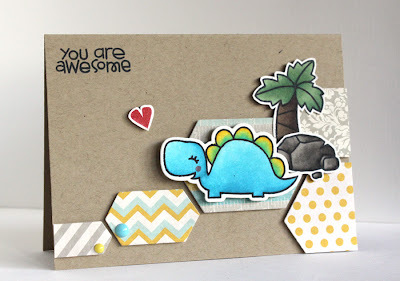 The sentiment is also from the Cuteasaurus set. Have a awesome day and thanks for stopping by! Hi ya, all! 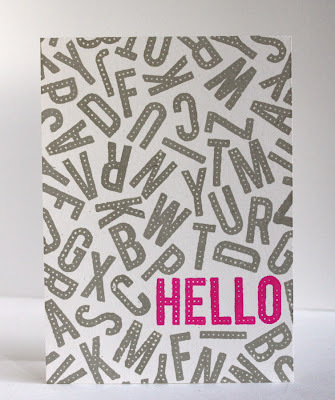 =) It's the last day of Mama Elephant April stamp highlight and we are focusing on the versatile Flashy Letters set. 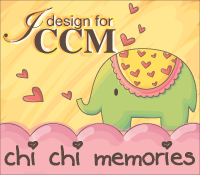 I once again played with creating background. This is really fun and quick to make and I can see a set of these with different sentiments as gift. 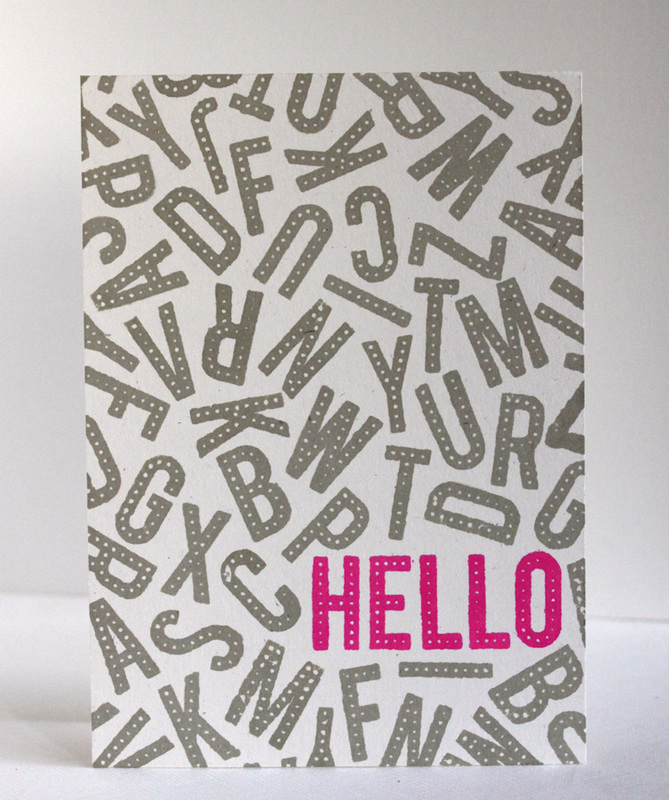 I went with the fun grey and neon pink color combo. Hope you likey! 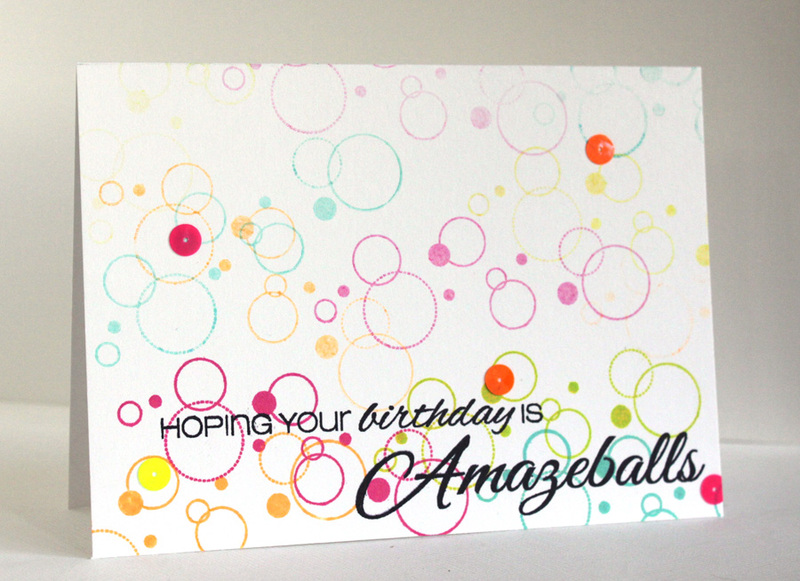 The sentiment is also from the Amazeballs set and a few neon sequins helped finishing the card. 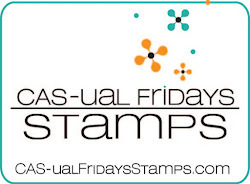 This week's sponsor is CAS-ual Fridays Stamps and they are providing a $45 gift certificate for the winner! How awesome is that? 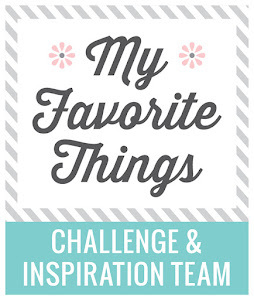 Don't forget to find out what the other Girl Fridays came up with for this challenge and all the details for the challenge at CAS-ual Fridays! 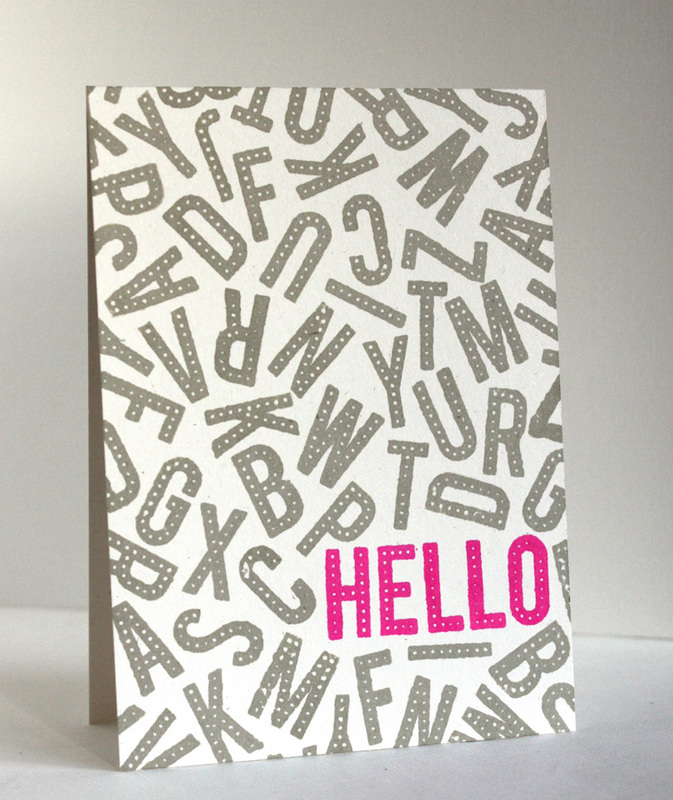 card size: 5 3/8" x 3 3/8"
Hello, my friends! 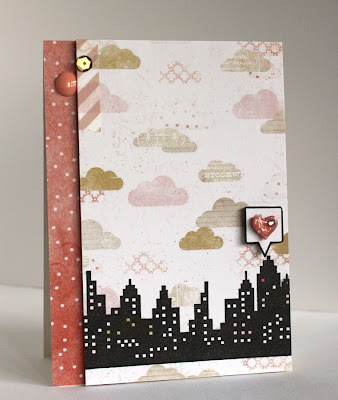 =) It's Day 2 of Mama Elephant April stamp highlight and we are sharing projects made using the fun Central Park set. The patterned paper is from Hello Friend 6x6 Paper Pack by Glitz. 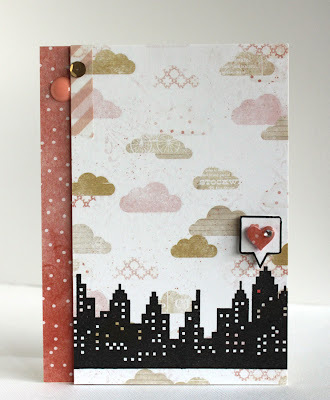 I punched a little heart from patterned paper, added Glossy Accents and a little gem for a little interest. 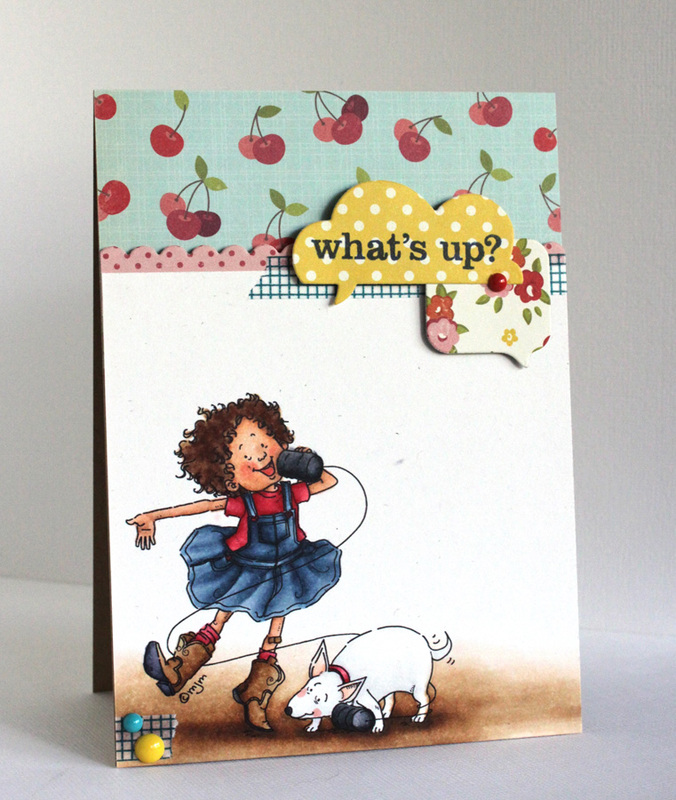 card size: 4"x 5 1/2"
Hi and welcome to Mo's Digital Pencil Monthly Blog Hop! 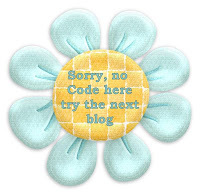 If you arrived from Pat's Blog, you are on the right track. 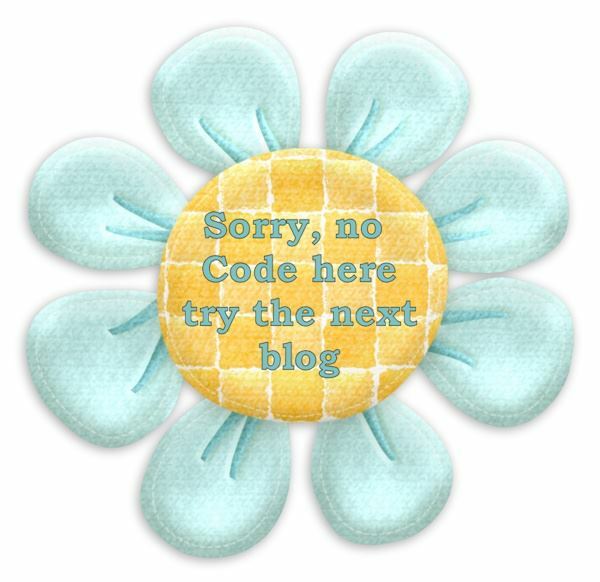 If not, you can start the hop from Pat's Blog. 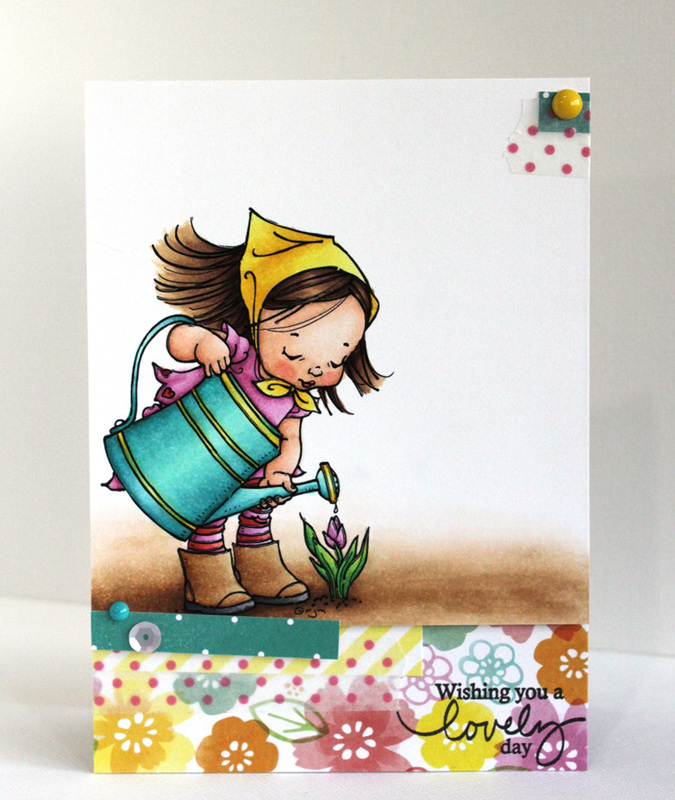 You wouldn't want to miss any stop of this fun hop! The theme for this month's hop is Spring and Mo created six new Spring images for this hop. 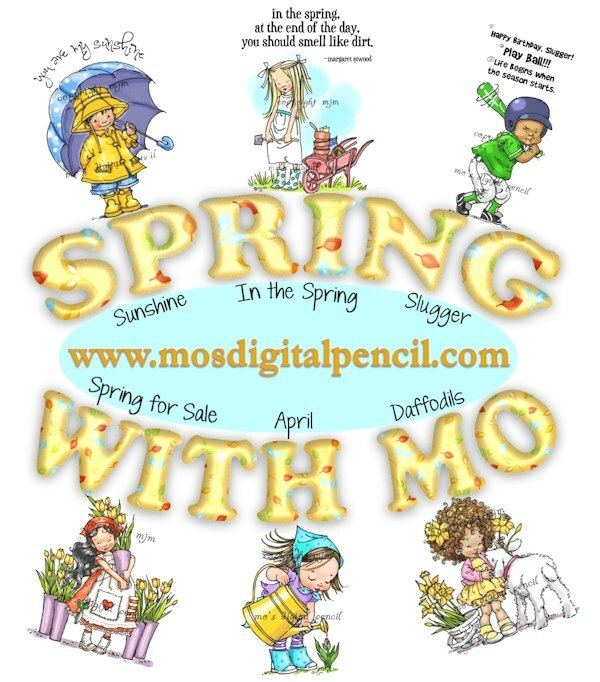 You can find them at Mo's Digital Pencil. 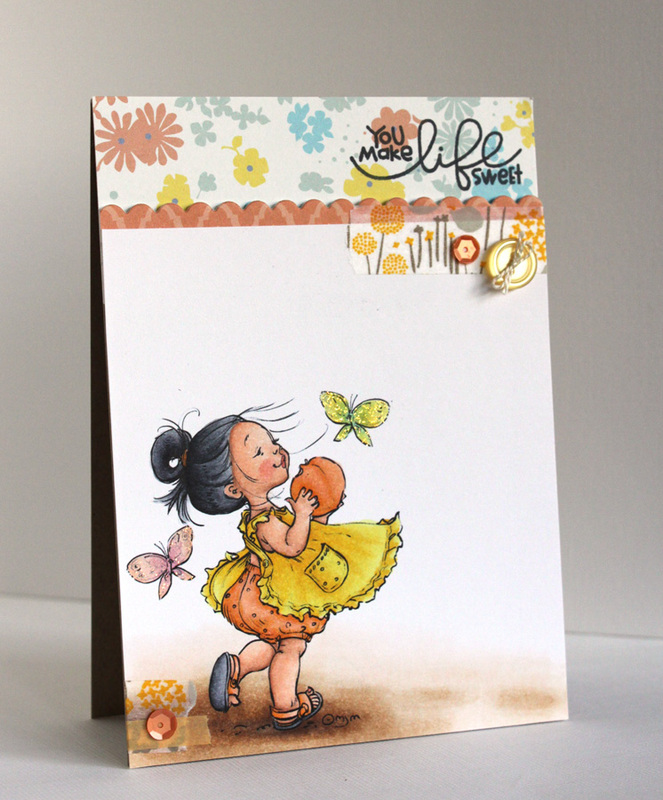 We are also hopping with design team members from Mo's Challenge Blog, so this is going to be a fun one! THREE of the designers each have a little piece of hidden code in their blog hop posts. Gather them all and you have a discount code for 25% OFF when you shop at Mo's Digital Pencil. 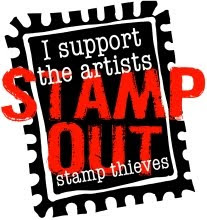 Don't forget to look for the codes as you go! =) Here is my card for the hop. 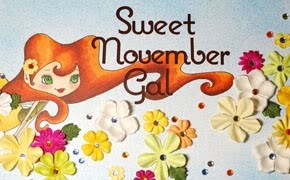 The image that I used is called April. 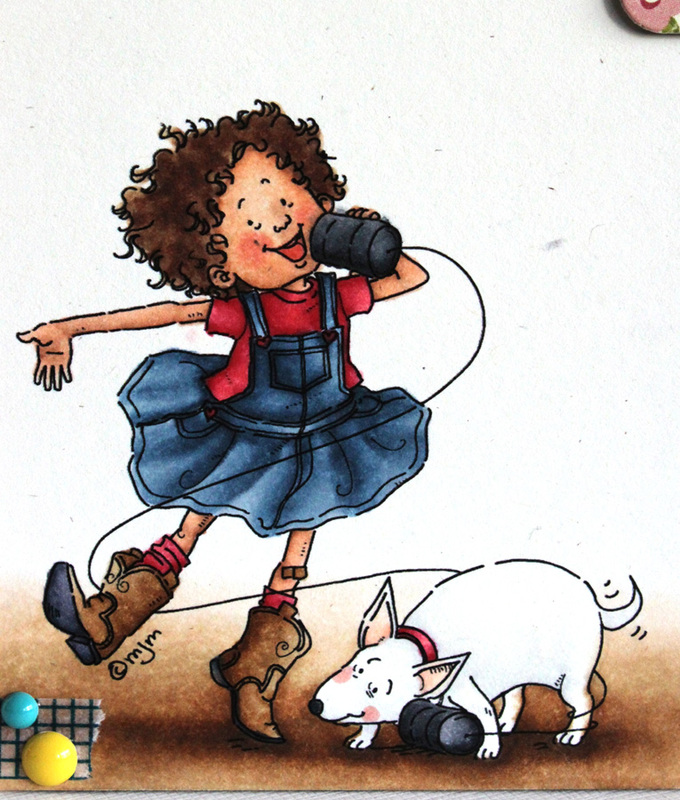 She is printed on Papertrey Ink's Stamper's Select White cardstock, colored with Copic markers then trimmed to size. 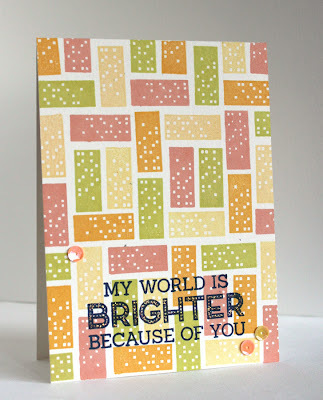 The patterned paper is from Yes, Please 6x6 paper pad by American Crafts and the sentiment is from Papertrey Ink. Hi, all! 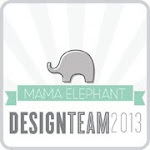 =) Today starts the stamp highlight for Mama Elephant's April release. We are showcasing the mod Bling set. The sentiment is also from Bling set. 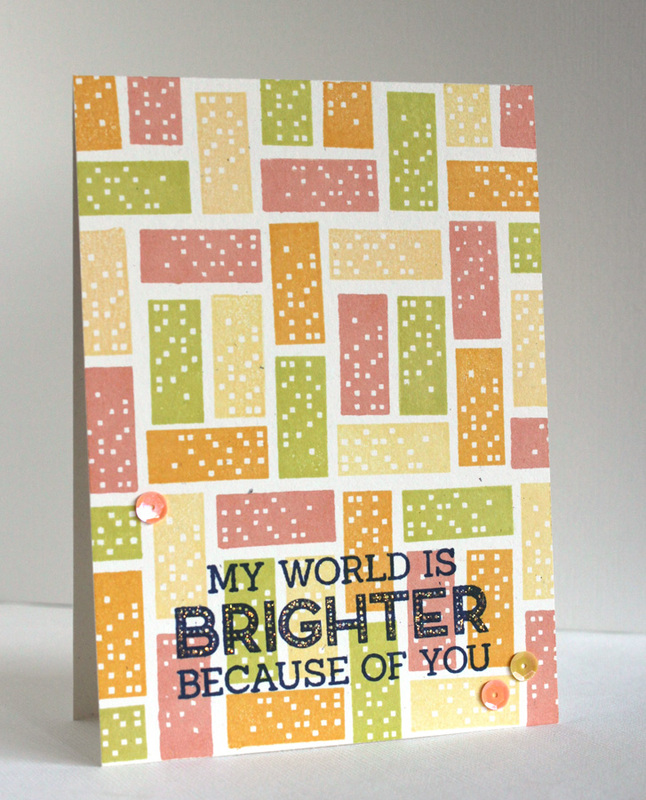 I added Diamond Stickles to the word "brighter" for a little sparkle.